Finally, a warm keto porridge that you can enjoy any which way you like it and today we’re serving it up Pumpkin Spice Cheesecake style. By that I mean it has everything you’d expect from a belly warming keto porridge topped with cream cheese and our homemade pumpkin spice consisting of nutmeg, ginger, cinnamon, cloves and all-spice. You may have heard about Noatmeal which is a grain-free, gluten-free, low-carb keto porridge that all low carb followers are thrilled about especially this time of year when the temperature drops in Canada. As the cold weather settles and eventually the snow is upon us there is nothing better than waking up to a hot bowl of keto porridge. What you might love about this keto porridge recipe is that you can store leftovers in the refrigerator for the next day or two and simply add a touch of water, heat and serve. Unlike traditional oatmeal, porridge or other hot cereals you have to eat them when you make them as the grains are filled with gluten that tend to seize and thicken like a brick so a grain-free keto porridge certainly holds up to leftover status. 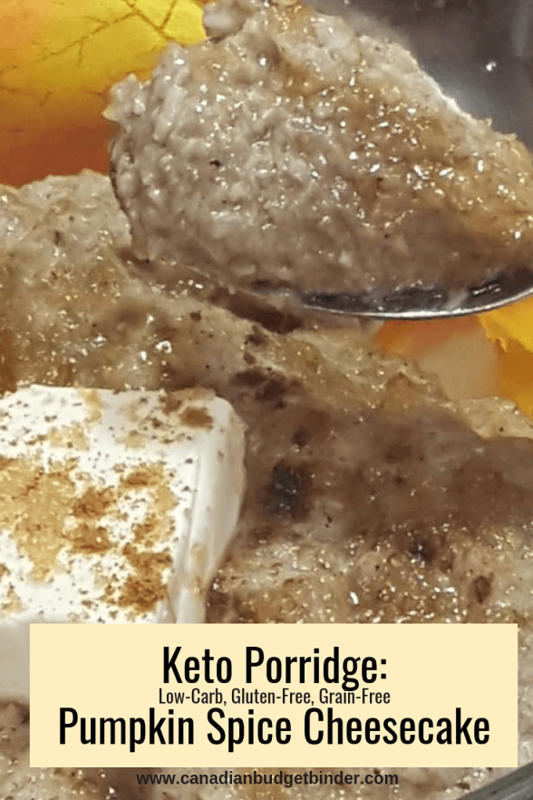 I’ve always been a fan of oatmeal or porridge which is what my mum would call it and so was Mrs. CBB (she still is a HUGE fan) When we found out we could make a keto porridge, Low Carb Oatmeal or Noatmeal we were all over that idea. After living the keto lifestyle for 3 years now Mrs. CBB feels she is complete with her meal plan as she has enough variety where breakfast was always the struggle. 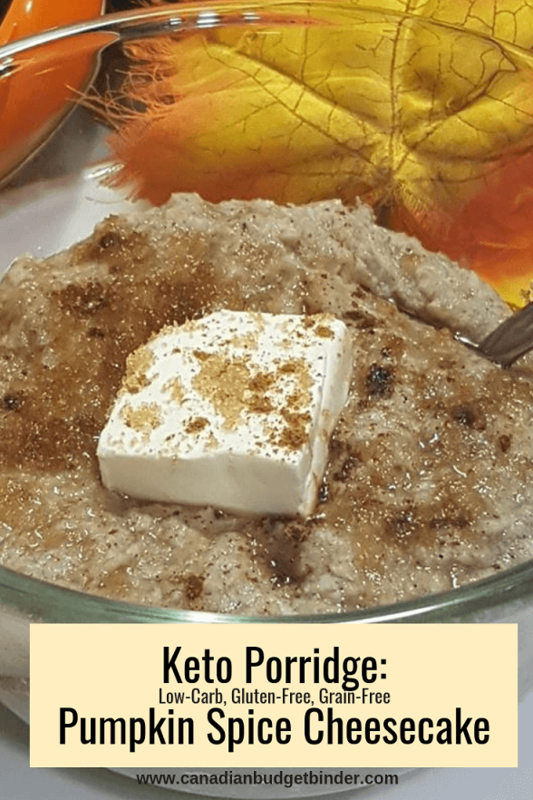 A friend of ours sent us her recipe but if you have a look on Pinterest you will find many recipes for Keto porridge but of different variations. Some cooks like to add coconut milk other almond milk for their liquid, we used both. You may also fancy using chia seeds, hemp hearts or other seeds in your keto porridge as we did but you can also leave them out. For the bulk of the recipe you will use almond flour (go to Costco it’s the cheapest we’ve found), coconut flour and a bit of milled flax-seed which you can find in just about any grocery store or at the bulk barn. I find that PC products from Loblaws seem to be reasonably priced and often have sales you can pair with your PC Optimum points card. What I love about keto porridge is that it is one of those low-carb breakfast cereals that you can switch up any way you like. You can also top it with whatever you like which is why we chose pumpkin spice cheesecake keto porridge for the win! I mean, it’s October now, pumpkins are pretty much everywhere and you know that you will see hundreds of keto pumpkin recipes filling your news feed on social media so you might as well join in if you are a pumpkin lover. This keto porridge really is a one-pot deal and you can also make it in your crock-pot or instant pot if you have one because it works equally as well. It takes no time at all to make this in the morning so you have something hot to put into your belly to start your day. We don’t own an instant pot and since Mrs. CBB will be eating this a medium-sized pot was all we needed to make 3 one-cup servings. Growing up in the UK Indian cuisine inspired me since it is as dominate of take-out as Chinese food is in Canada. I was always trying new recipes using the best coconut milk I could find. For this keto porridge we opted for a high quality Thai Kitchen Pure coconut milk and coconut water with a splash of cream. 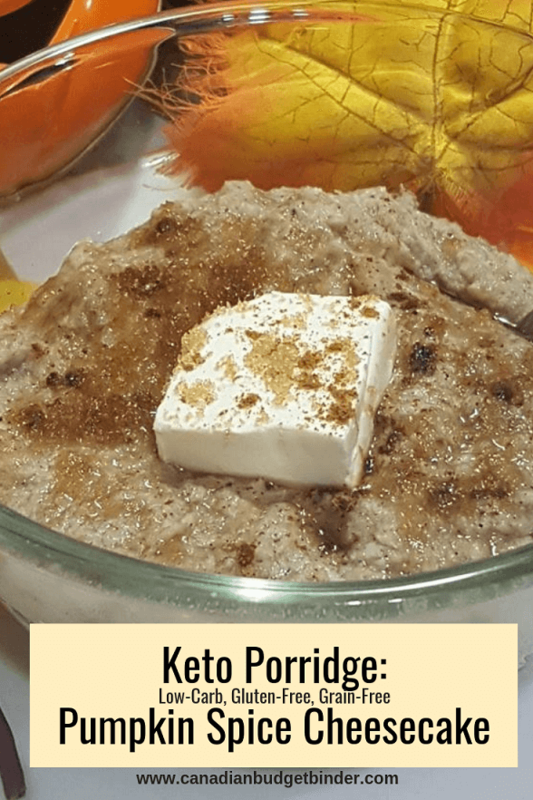 Almost all keto porridge recipes use shredded coconut but we just happened to have an unsweetened coconut by Yupik Canada that we felt was perfect for this recipe since it is organic, desiccated fine coconut. We also added in some Manitoba Harvest hemp hearts and psyllium husk which every low-carb, keto chef should stock in their pantry as it is widely used as a thickener or binder. When it comes to toppings for your keto porridge go with what you like. In this case we’re sharing this during the Fall season so we felt a pumpkin spice cheesecake keto porridge was in order. You can also keep it keto by adding blueberries, raspberries or other low-carb fruits that are part of the keto diet. Take your keto porridge to another level and add some nut crunch with such toppings as toasted pumpkin seeds, almonds or sunflower seeds. I also know that porridge needs to have sweetness to it so if you’re not a fruit fan add some Sukrin Gold brown sugar like we did, Lakanto sugar-free maple syrup is amazing, monk fruit or any other keto approved sweetener that you fancy. Enjoy a ketogenic breakfast with this low carb porridge to soothe your soul. Over medium heat in a pot add your coconut stirring constantly so it does not burn. You want to toast it to a golden brown colour. Add 1 can of coconut milk, water, cream and butter and bring to a boil. Once the coconut is boiling lower the heat to low or 3 on the dial and add all of the other ingredients minus the toppings. Stir until it becomes a thick oatmeal consistency. Add more water, cream or almond milk if you find it becomes too thick for your liking. We found this perfect for us. So now you know that you don’t have to go without porridge if you are living a low-carb keto lifestyle or if you are gluten-free with this simple recipes. Ideally you’ll want to stock your pantry with common keto staples so you are able to make this and other delicious recipes at home instead of having to buy them pre-made or in boxes. Saving money is the name of the game right? Enjoy you Keto porridge and a happy breakfast belly. Discussion: If you’re not a fan of pumpkin what would your keto porridge taste like?